The latest offering from Azimut is 87 feet of pure bliss. This yacht effortlessly blends luxury and performance. Unique features abound, such as the huge port and starboard side windows that give the full-beam master stateroom the feeling of being open to the sea. Three guest staterooms and two crew cabins allow entire families to travel the world in comfort. The combination of twin V12 1,900 h.p. engines and a 9,500-gallon fuel tanks allows the Azimut Grande Metri 27 to travel anywhere on the globe at a stately 24 knots. To optimize ride comfort and fuel efficiency, the yacht is equipped with a Humphfree Automatic Trim System which allows owners to run the boat themselves, rather than having to hire a captain. To further simplify boat operations, the bridge is equipped with the latest tech from Simrad to ensure effortless navigation from one port to the next; AzimutYachts.com. RIBs — Rigid Bottom Inflatables — are popular with the Navy because the deep-v fiberglass hulls are surrounded by huge inflatable tubes that act like shock absorbers to make them stable and safe even in rough sea conditions. When operated on calm waters, the ride is superlative. The new Technohull Omega 45 is the ultimate RIB. It is 45 feet long and rated for up to four 400-hp outboard engines. It can go from Miami to Bimini in under an hour in sea conditions that would keep most other boats alongside the dock. 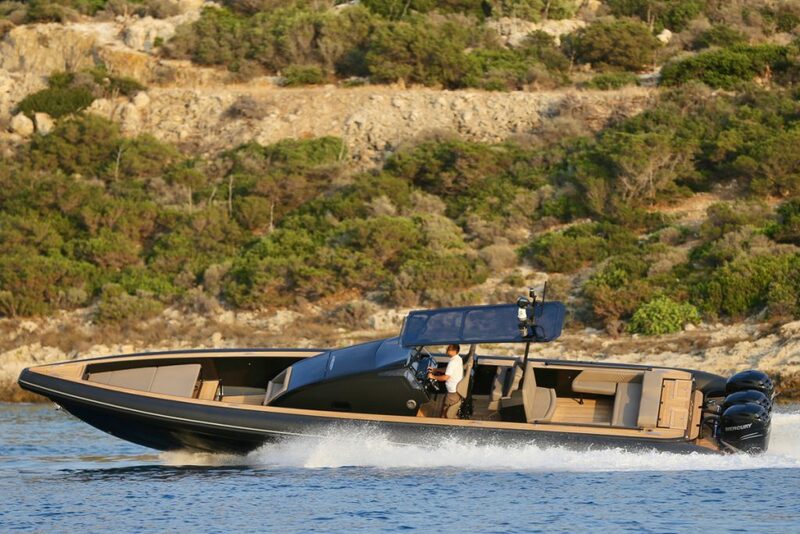 Underneath the teak decks, the fiberglass and carbon fiber structure is literally bullet-proof. The open layout allows ample room for guests forward, at the helm and in the aft lounge serviced by an outdoor galley. 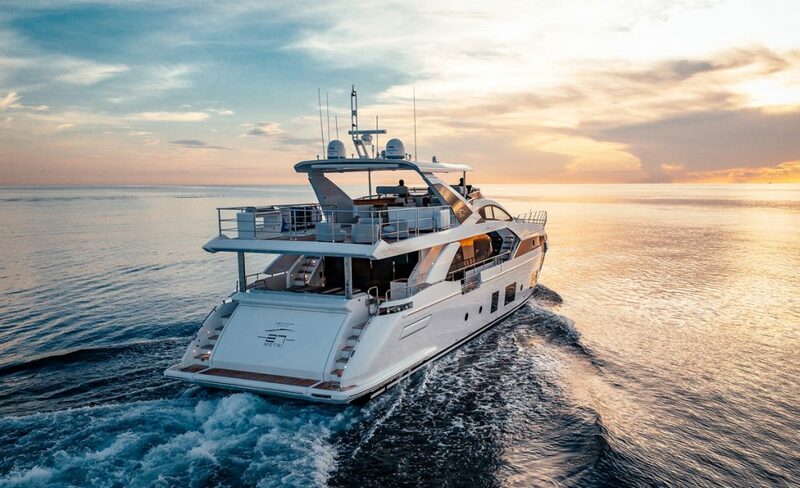 A large T-top shades the helm area, which features a cabin complete with Alcantra upholstery, overnight accommodations for 4 and a full-size head with shower; Technohull.com. The term “SUV” is most often used to describe extremely capable, practical and often luxurious vehicles that can transport people and gear across long expanses of highway. The Riviera SUV 575 is all that, but on the water. 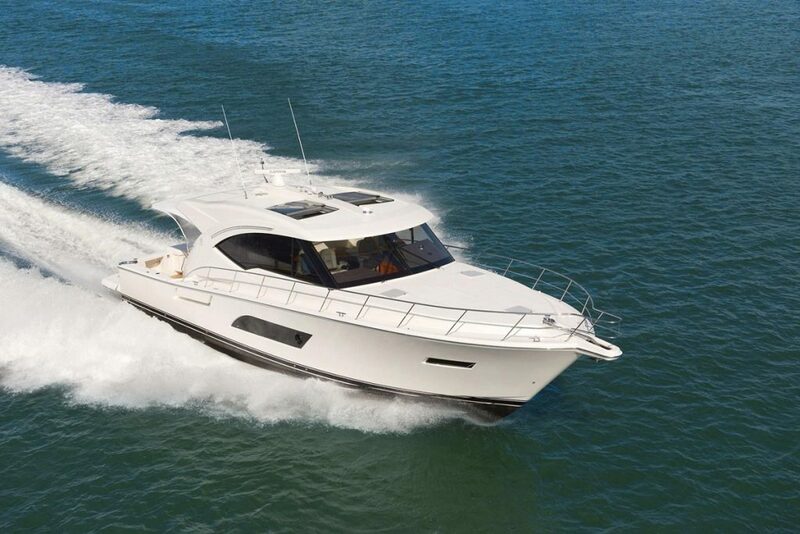 The 3-stateroom, two head luxuriously appointed layout makes the 575 ideal for family cruising. The expansive cockpit equipped with a full outdoor galley is ideal for fishing, diving or just taking in the sights. Joystick steering and touchscreen electronic navigation systems makes operating the 575 easier than driving a car through Brickell, even for those whose last maritime adventure involved a small boat in a bathtub. The interior flows seamlessly as you step in from the cockpit, from the aft galley to a sitting/dining area then to the bridge and from there forward to the staterooms. The 575 is very well-equipped with twin 725-hp Volvo Penta D11 engines. Larger engines are available for those in a hurry to get to paradise; RivieraAustralia.com. Old boats are beautiful to look at but can be a bit of a nightmare to maintain. Hylas has resolved this dilemma by building boats that appear to be traditional but are actually packed with state-of-the-art technology. 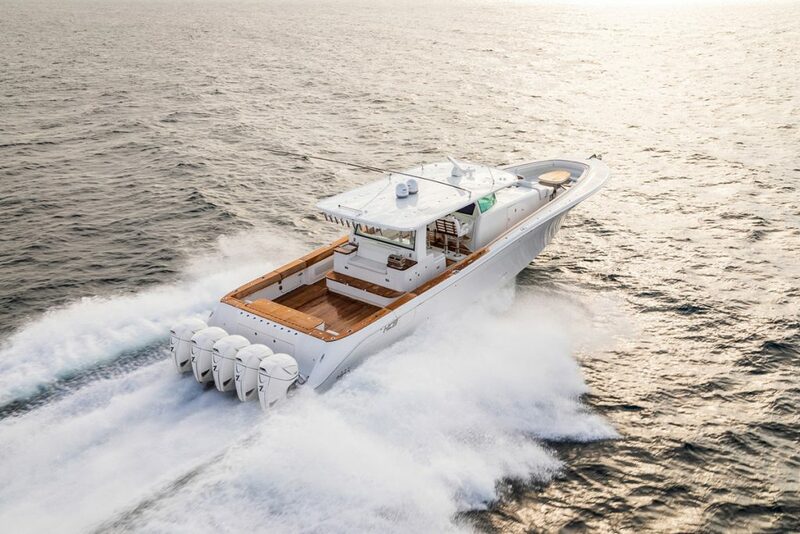 The new Hylas 44 is made for South Florida waters, with an open, teak-accented cockpit and a full-length overhead to shade guests from the sun. The swim platform converts any anchorage into a wading pool. Overnight accommodations consist of a v-berth master forward and a guest stateroom, with room for two more in the salon/dining area. The helm features excellent sightlines, a complete suite of electronics and a bowthruster that allows precise maneuvers in tight anchorages. 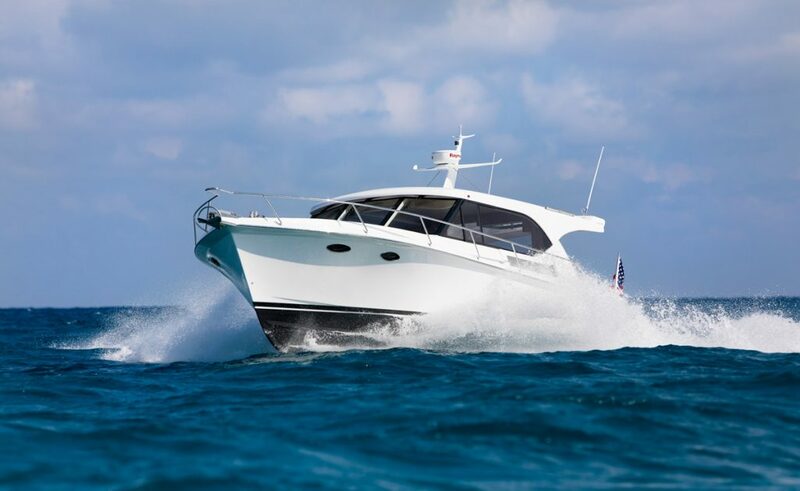 Two 370-hp Yanmar turbodiesels provide reliable thrust and fuel frugality, making the most of the 240-gallon fuel tank; HylasYachts.com. The trend of ever-larger center consoles powered by a massive collection of huge outboard engines has reached its pinnacle now that the HCB Estrella has arrived. At 65’ LOA with a 16’ beam, and 5, yes FIVE, huge outboard engines, it is a force of nature all its own. Yet it does so without being gauche. If you long for a boat that will cause jaws to drop as you pass by, this is it. Estrella redefines center console boats. While most are simply an open deck with a helm and some seating exposed to the elements, Estrella has a full-size cabin and a master stateroom. The hull has no maximum horsepower rating, with room for up to five of the largest outboards you can find. Yes, she will go through fuel faster than a politician spends campaign funds, but the 1,500-gallon fuel tank will get you from one fuel dock to the next without batting an eyelash. Watch on as even the saltiest critics are forever silenced by this floating example of shock and awe; HCBYachts.com.